McGraw-Hill, 2005; ISBN 0071-4060-50; hardcover 437pp; List $70 U.S. In this book, we apply the same hard-edged, research-orientated approach used in The Encyclopedia of Trading Strategies to the problem of evaluating the worth of options. A variety of methods are investigated, from conditional distributions and multivariate polynomial regressions (using Chebychev polynomials) to hybridized neural networks. The studies demonstrate that one can do much better than Black-Scholes when it comes to pricing options, especially under certain market conditions. If you have a mathematical bent, want the same kinds of technology that the market makers and institutional traders have access to, and if you trade stocks or stock options, then this book is for you. 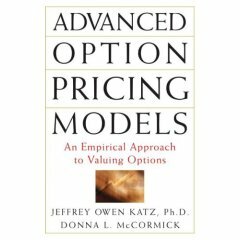 "Katz and McCormick's rigorous data studies and their experiences as traders lead to useful solutions for option modeling. In addition, their ability to write in clear English should be studied by all financial authors." --Howard L. Simons, President, Rosewood Trading; contributing editor, Futures magazine; author of The Dynamic Option Selection System: Analyzing Models and Managing Risk. Introduction. Thinking out-of-the-box. Improving option pricing strategies: A scientific investigation. Assumptions made by popular models. Optimal model inputs. Chapter 1: A Review of Option Basics. Factors influencing option premium (from well-known factors to skew, kurtosis, and cycles). Uses of options. Option pricing models. The Greeks. The influence of various factors on option premium. Put-call parity, conversions, and reversals. Synthetics and equivalent positions. Chapter 2: Fair Value and Efficient Price. Fair value and the efficient market. The context dependence of fair value. Estimating fair value. Fair value and arbitrage. Fair value and speculation. Estimating speculative fair value. Chapter 3: Popular Option Pricing Models. Cox-Ross-Rubinstein binomial model (specifying growth and volatility, Monte Carlo pricing, pricing with binomial trees). Black-Scholes (and forward expectation; versus binomial pricing). Means, medians, and stock returns (empirical study). Chapter 4: Statistical Moments of Returns. The first four moments (their calculation and features). Study 1: Moments and holding period (segmented analysis: statistical independence and log-normality of returns, estimating standard errors; non-segmented analysis: volatility and independence of returns, skew, kurtosis, and log-normality; non-segmented analysis of two indices). Study 2: Moments and day of week. Study 3: Moments and seasonality. Study 4: Moments and expiration. Chapter 5: Estimating Future Volatility. Measurement reliability. Model complexity and other issues. Empirical studies of volatility (calculation of implied volatility). Study 1: Univariate historical volatility as predictor of future volatility (regression to the mean, quadratic/nonlinear relationship, changing relationship with changing volatility, straddle-based vs. standard future volatility, longer-term historical volatility, raw data regressions). Study 2: Bivariate historical volatility of future volatility (independent contributions, reversion to long-term mean). Study 3: Reliability and stability of volatility measures. Study 4: Multivariate prediction of volatility (using two measures of historical volatility and three seasonal harmonics). Study 5: Implied volatility. Study 6: Historical and implied volatility as related to future volatility (regression results, correlational analysis, path analysis). Study 7: Reliability of implied volatility. Chapter 6: Pricing Options with Conditional Distributions. Degrees of freedom (problem of excessive consumption, curve-fitting, use of rescaling to conserve degrees of freedom). Study 1: Pricing options using conditional distributions with raw historical volatility. Study 2: Pricing options using conditional distributions with regression-estimated volatility (analytic method, deviant call premiums, other deviant premiums, non-deviant premiums). Study 3: Re-analysis with detrended distributions. Study 4: Skew and kurtosis as additional variables when pricing options with conditional distributions (effect on out-of-the-money calls, out-of-the-money puts, in-the-money options, at-the-money options). Study 5: Effect of trading venue on option worth (out-of-the-money options, detrended distributions; at-the-money options, detrended distributions; out-of-the-money options, no detrending). Study 6: Stochastic crossover and option value (out-of-the-money, detrended distributions; out-of-the-money, raw distributions; at-the-money options). Chapter 7: Neural Networks, Polynomial Regressions, and Hybrid Pricing Models. Continuous nonlinear functions. Construction of a pricing function. Polynomial regression models. Neural network models. Hybrid models. Study 1: Neural networks and Black-Scholes (can a neural network emulate Black-Scholes? test of a small neural network, test of a larger neural network). Study 2: Polynomial regressions and Black-Scholes. Study 3: Polynomial regressions on real-market data. Study 4: Basic neural pricing models. Study 5: Pricing options with a hybrid model. Chapter 8: Volatility Revisited. Study 1: Volatility and historical kurtosis. Study 2: Volatility and historical skew. Study 3: Stochastic oscillator and volatility. Study 4: Moving average deviation and volatility. Study 5: Volatility and moving average slope. Study 6: Range percent and volatility. Study 7: Month and volatility. Study 8: Real options and volatility. Chapter 9: Option Prices in the Marketplace. Study 1: Standard volatility, no detrending. Results (calls on stocks with 30 percent historical volatility and with 90 percent historical volatility, puts on stocks with 30 percent historical volatility and with 90 percent historical volatility). Conclusion (discussion of issues, suggestions for further study). Conclusion. Defining fair value. Popular models and their assumptions (strengths and weaknesses). Volatility payoffs and distributions. Mathematical moments (moments and holding periods, moments and distributions, moments and day of the week, moments and seasonality, moments and expiration date). Volatility (standard historical volatility as an estimator of future volatility, the reliability of different measures of volatility, developing a better estimator of future volatility, implied volatility). Conditional distributions (historical volatility: conditional distributions vs. Black-Scholes; regression-estimated volatility: conditional distributions vs. Black-Scholes; detrended distributions: conditional distributions vs. Black-Scholes; distributions and the volatility payoff; skew and kurtosis as variables in a conditional distribution; conditional distributions and venue; technical indicators as conditioning variables). Using nonlinear modeling techniques to price options (neural networks and polynomial regressions vs. Black-Scholes, strengths and weaknesses of nonlinear modeling techniques, hybrid models). Volatility revisited (the impact of historical skew, kurtosis, and historical volatility on future volatility; using technical indicators in the prediction of future volatility). Option prices in the marketplace. Copyright © 2005. Scientific Consultant Services,Inc.